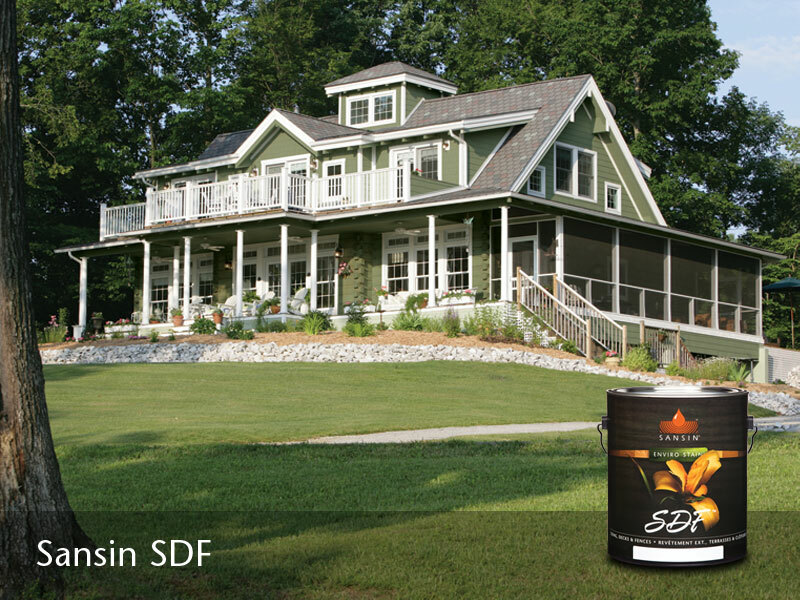 Exterior protection for siding, decks, furniture and millwork. 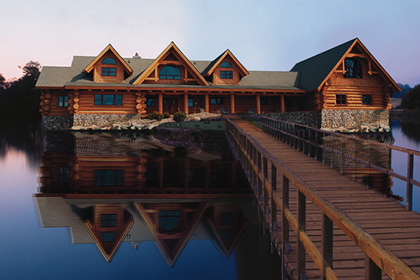 Should you protect your wood home with a water or an oil-based coating? 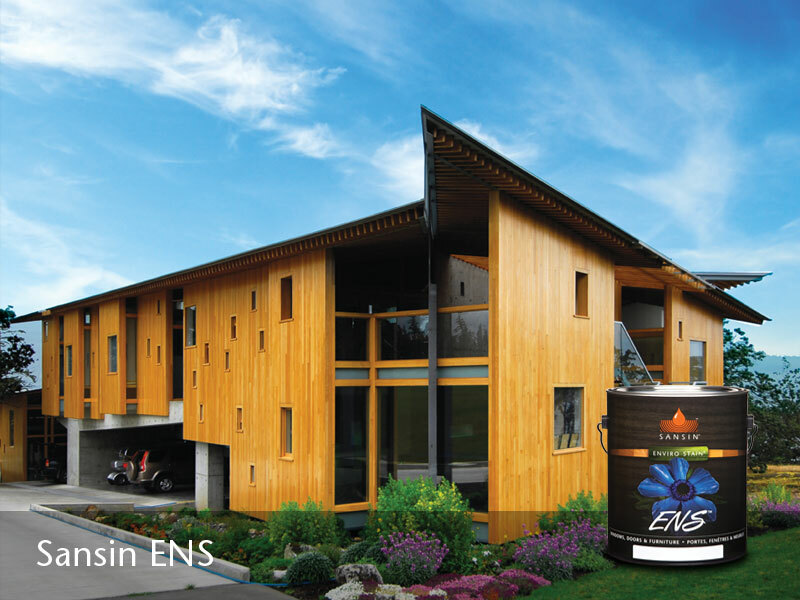 With Sansin’s line of Exterior Enviro Stains, you can have the best of both worlds. Modified natural oils and resins are carried deep into the wood’s cell structure using one of nature’s commonplace miracles – water. As the water evaporates, Sansin bonds directly with the wood substrate, forming a tough, durable barrier that won’t crack, peel or blister. Our unique formulas offer every possible level of finish – from penetrating natural finishes, to high-gloss barrier coatings, you can match the look of your Enviro Stain with the protection your project needs. No matter which Sansin exterior product you choose, you can count on exceptional beauty and lasting performance. The science behind healthy wood. Wood is a tremendously versatile material – and as long as it’s protected, a strong and durable one. Water, ultraviolet (UV) rays and fungi can all seriously damage your wood exterior. Sansin’s penetrating formulas let wood “breathe“ more freely, improving dimensional stability and allowing wood to adjust naturally to moisture levels in the environment. 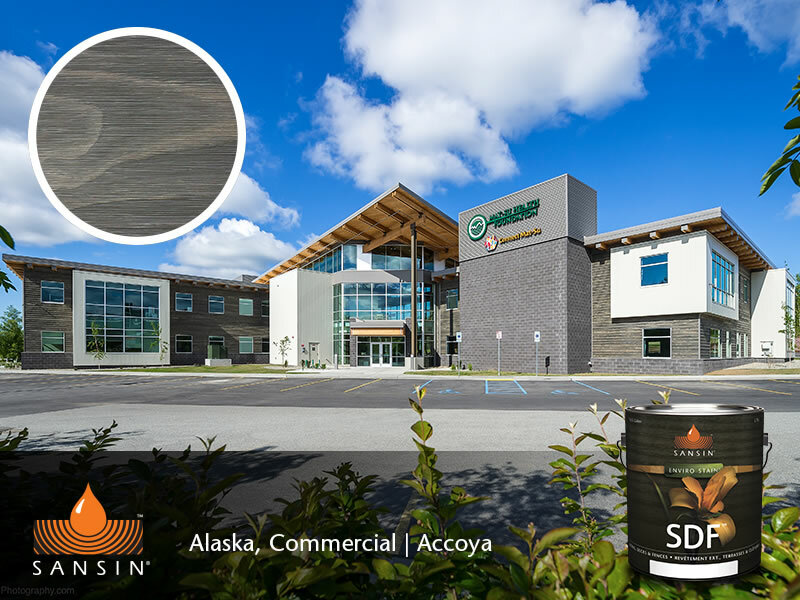 Sansin forms a monolithic bond with your wood that aggressively repels condensed water while allowing moisture vapor to escape.For barrier coat applications, Sansin offers high-build formulas that lock out moisture and offer maximum UV protection. The paraffin waxes that protect against water in many water and solvent-based coatings are easily damaged by exposure to UV radiation – just 5 hours of direct sunlight can reduce their water repellency dramatically. Sansin’s modified natural oils and resins are impregnated with special UV protectants so every exposed cell of your wood is protected. 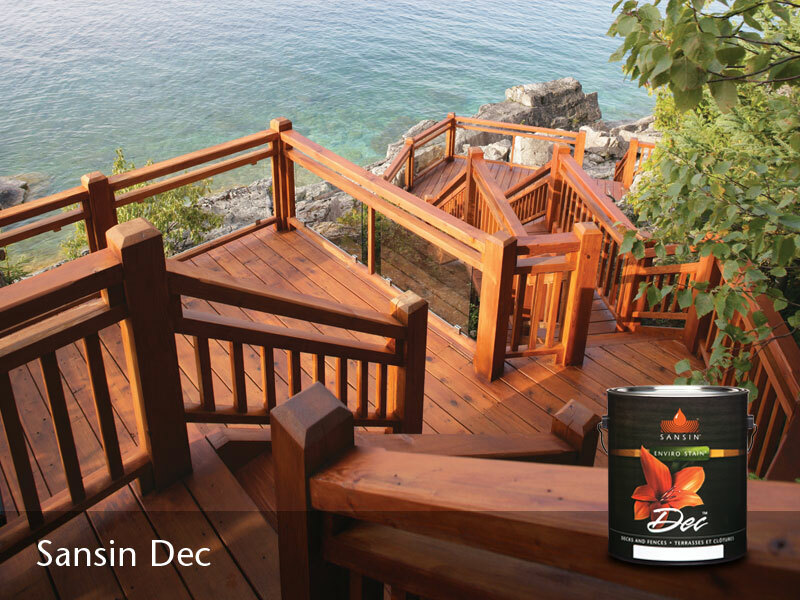 Because of their unique formulation, Sansin Enviro Stains also help protect naturally against wood rot. 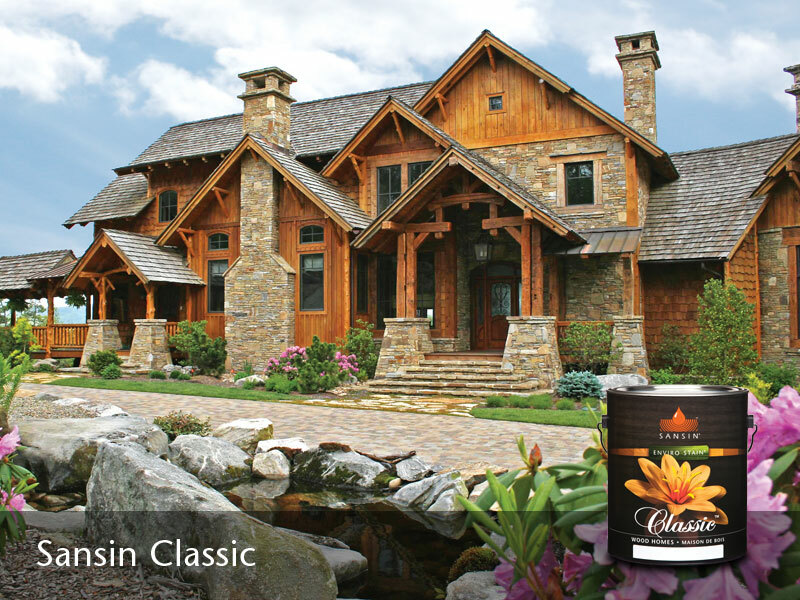 If you’re looking to protect and enhance the beauty of your siding, deck, furniture or millwork, Sansin has an Enviro Stain that’s right for your project. 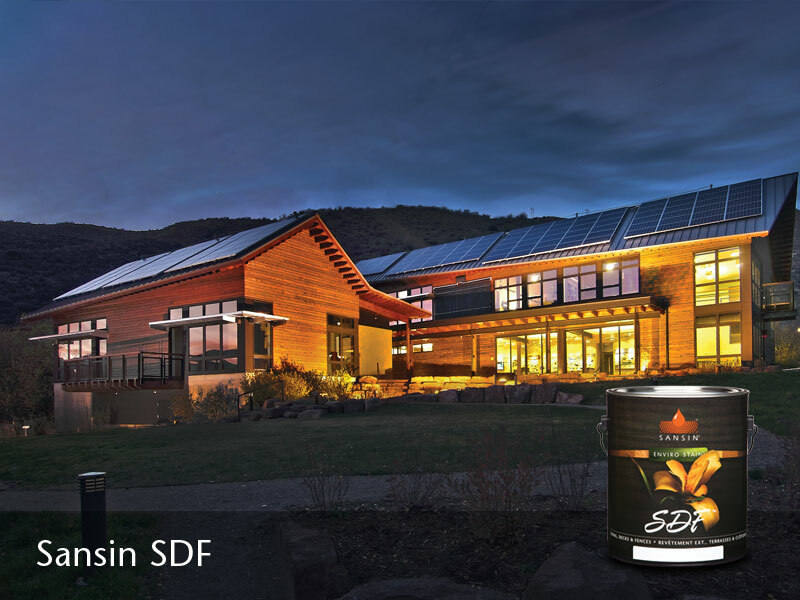 Scroll down for an overview of our family of exterior wood protection products – or get inspired by browsing the Photo Gallery below for examples of beautiful exterior projects featuring Sansin Enviro Stains. Beautiful protection for timbers, decks, siding ceilings and walls. Derived from recycled interior and exterior Enviro Stain wood finishes. Zero-VOC water-borne penetrating sealer that aggressively repels water while allowing wood to bleach to a uniform driftwood silver. One coat protection for concrete and masonry. Water-repellant coating engineered to protect new and existing above-ground concrete and masonry from weather damage. Ultra-low VOC, ready to use, water resistant protective coating designed for application to cut ends of Pressure Treated Lumber.